Please join us this Thursday (2/26) for the second installment of our Lunchbox Lecture Series with President April Cheek-Messier. Explore the extraordinary life of Eugene Bullard, the first African-American pilot and spy in World War I. The lecture will be held at the Bedford Welcome Center Community Room, promptly at noon until 1 PM. Admission is free, but donations are greatly appreciated. For more information, please call the office at (540) 586-3329. On this day, 71 years ago, Major General Frank Merrill led a guerrilla style campaign through the northern areas of Burma. Nicknamed ‘Merrill’s Marauders’, the unit’s purpose was to engage in a “long-range penetration mission” agreed upon by both President Franklin D. Roosevelt and Prime Minister Winston Churchill in August 1942. Brig. Gen. Frank Merrill directing troops. The unit’s objective would comprise of cutting Japanese communications and supply lines, and to essentially create chaos within the enemy’s lines. The idea of such a daring mission was to prepare a vantage point for General Joseph Stillwell’s Chinese American Force to reopen the Burma Road, which would reopen a major supply channel back into China. Since a mission such as this had never been done before, a ‘wanted’ ad was sent out, under the president’s permission, to attract soldiers to volunteer for a ‘dangerous and hazardous mission’. The US military knew their objective would be extremely difficult to obtain and volunteers were vital. The sheer volume of stateside soldiers, nearly 3,000 men, who volunteered created the 5307th Composite Unit, code named “Galahad”, which would ultimately be remembered as Merrill’s Marauders. 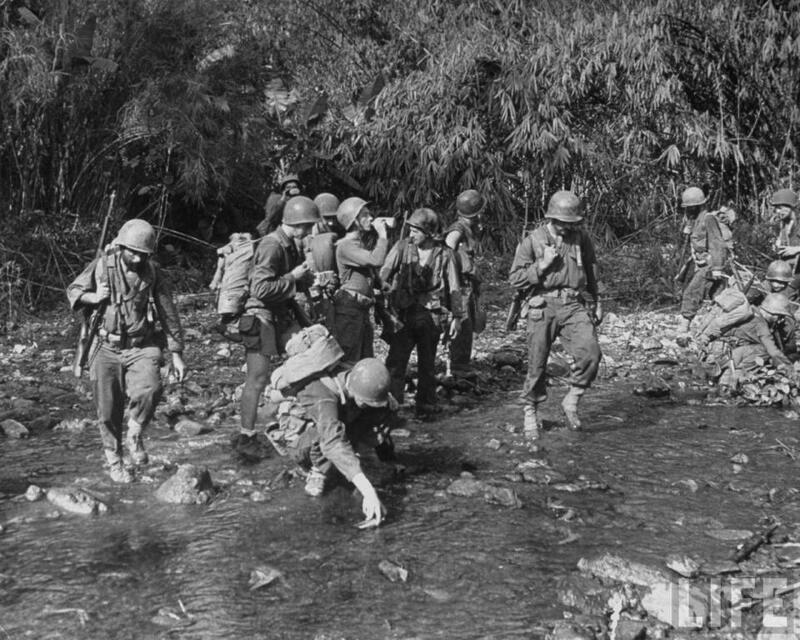 Merrill’s Marauder’s trudging through the Burma jungle. Training for this unique mission took place in the jungles of India, where Brig. 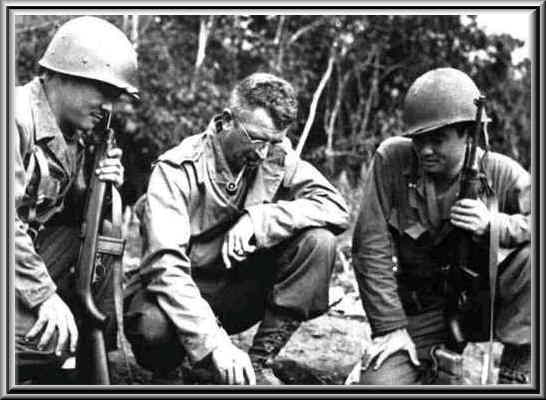 Gen. Merrill taught his soldiers the art of guerrilla warfare. The unit was split into six combat units each with 400 men, Red, White, Blue, Green, Orange, and Khaki. The remaining 600 men were to stay in India to coordinate airdrops of supplies to the men fighting. On February 24, 1944, the Burmese campaign began with a 1,000-mile walk through thick jungle without artillery support. Carrying their supplies on their backs and on mules, and only being resupplied by airdrops, the men withstood five major engagements with the enemy, and nearly 30 minor engagements. Merrill’s Marauders were so successful at confusing and disrupting the Japanese; they were able to capture the Myitkyina Airfield in the process. By that engagement, only 200 soldiers, of the original total, were present to take the field. A week later, on August 10, 1944, the unit was disbanded with a total of 130 men left. Out of the 2,750 men to enter Burma at the start of the mission, only two made it through without hospitalization of major wounds or illness. Soldiers taking a brief rest in the jungle. The mission was so physically grueling, the surviving Marauders had to be evacuated to hospitals and soon as humanly possible. The men diagnosed with “Accumulation of Everything”, which included exhaustion, tropical diseases, and malnutrition, to name a few. The unit was awarded the Distinguished Unit Citation, currently known as the Presidential Unit Citation, in July 1944. Each soldier was also awarded the Bronze Star, which was extremely rare for an entire unit to receive. These heroic men battled impossible odds, sustained devastating losses, and yet managed to succeed in their objective. Without their miraculous efforts, the course of the war would have taken a destructive turn.